Driving from LA to Palmdale, my coworker Tony wanted to stop and grab a bite in Santa Clarita. He originally wanted Subway, but I talked him into the In-N-Out burger instead, which he had never had before. Myself, I’ve been to In-N-Out burger more times than I can count, but, oddly, I haven’t written it up here yet. Burgers are a very interesting menu item, since the same simple formula (burger, bun, condiments) can turn out very, very different depending on how the whole thing is put together. I know I could get slapped silly by some people for even doing this comparison, but consider (a) a Slider, (b) McDonalds, (c) Cheeburger Cheeburger, and (d) The Jucy Lucy. Four very different burgers. Four very different flavors. But In-N-Out seems to do it’s niche very, very well: a griddle-fried burger with cheese and “special sauce”, served with nicely done fresh french fries. The meat is always fresh (no frozen patties here), the onions fresh, and the buns nice and soft. Everything is nicely grilled to order as you wait. I usually do the standard “double double”, but sometimes also opt for it “Animal style” (fried in mustard, with fried onions and extra sauce), but I quickly tire of the special sauce. And never forget the fries. The two things I’ll always like about In-N-Out is the way I can actually custom order my fries. Usually I like my fries crisp, but every once and a while I like them on the softer side. In-N-Out actually lets me order my fries “light” or “well-done” (the latter I don’t recommend, however). 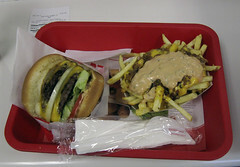 And you can have the fries “Animal style” as well, too (shown). 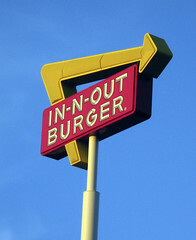 To me, In-N-Out isn’t the be-all-and-end-all that many make it out to be. It’s just one of many wonderfully good burgers to be had out there. But it’s definitely worth checking out if you’ve never had it.